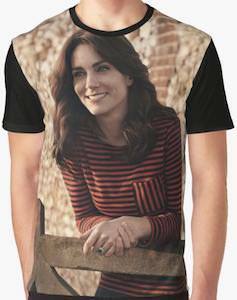 If you like the British royals then you are going to like this Kate Middleton t-shirt. The t-shirt has black sleeves and back but the rest of the shirt is filled with a nice photo of Kate Middleton. Kate is smiling and leaning on a gate and just likes happy to be where she is and that is on your t-shirt. The unisex t-shirt will look great on both men and women and comes in sizes XSmall – 2XL. So now you can the wife of the future king on your t-shirt and that is an amazing way of showing your love of royalty.